Principal Kyesha Jackson outside P.S. 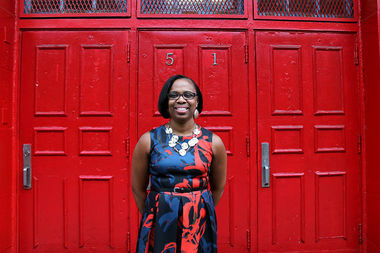 67 at 51 St. Edwards St.
FORT GREENE — Principal Kyesha Jackson is making sure her school is a place students want to be. The principal, who is in her second year at P.S. 67 Charles A. Dorsey School, located at 51 St. Edwards St., has helped boost attendance at the Fort Greene renewal school, which once struggled with chronic student absences and had been targeted for closure by the Department of Education. Since Jackson’s time at P.S. 67, attendance has grown from an average of 88.5 percent in the 2013-2014 academic year to an average of 92 percent so far for the 2016-2017 school year. “As a staff, we’ve worked tirelessly just to encourage our scholars and to make this a place where they want to be,” Jackson said. Jackson said the school has kept attendance high by creating a constant stream of new activities that the students won’t want to miss out on. For example, students were encouraged to dress up as their favorite storybook characters on “Character Day” this Halloween. The students read from their books with teachers who were also dressed in costume. The school has also been offering incentives to show up; students who have perfect attendance or are improving get to participate in a class trip outside of New York. Last year’s trips took kindergartners through second graders to the Crayola Factory in Easton, Pennsylvania. Third through fifth graders went to the Turkey Hill Ice Cream Factory in Columbia, Pennsylvania. The trips are a big deal for the students, some of whom have never left the city. The majority of students at P.S. 67 — located in a red brick building in the middle of the Ingersoll Houses — live in public housing, and some live in shelters. Jackson, who was born and raised in Bedford-Stuyvesant, said she wants her students to learn from exposure to the world outside their immediate community. Jackson sat down with DNAinfo New York to discuss the future of P.S. 67 and what makes it unique. This interview has been edited and condensed for clarity. Every morning I have a morning meeting in the auditorium with the staff and entire student body. I start with an inspirational talk, tell them it’s going to be a fabulous day and we have a discussion about what’s going to happen that day. We have a value of the month and we’ll talk a little bit about that. Just having those inspirational words every morning, they look forward to that. What is your philosophy as a principal? My philosophy is that everyone can be a success and success looks different for everyone. So my success might not look like your success, but if I set my goal and I reach that goal I have become successful in this area. All of my scholars will be successful in their own right and we need to assist them in realizing what that success looks like for them. What makes P.S. 67 unique? P.S 67 is one of the first African-American schools in Brooklyn. There had been such a stigma over the school that no one remembered it was founded when there were tough times for African Americans. The school was here to give everyone hope that they would be able to get an education and be able to be successful. This school is special because it was founded on a legacy of hard work and determination and the importance of education. It’s a legacy that can and will be realized by our current generation. And it’s important for our scholars to know that regardless of circumstance they can and will be successful. What is your vision for the future of P.S. 67? I definitely see our school being highly focused on the integration of arts within the academic curriculum. We are going to promote academic excellence and rigor so our scholars know that they are the best, they are better than the rest, and they will be able to show it. And I want the school to be able to promote academic success, not only based on test scores, but on who the students are as individuals. I want us to be a school that the community is proud of and will be proud of for years to come.